I love sad plays. I love stories of miserable families who love each other but don't know how to express it in healthy ways. 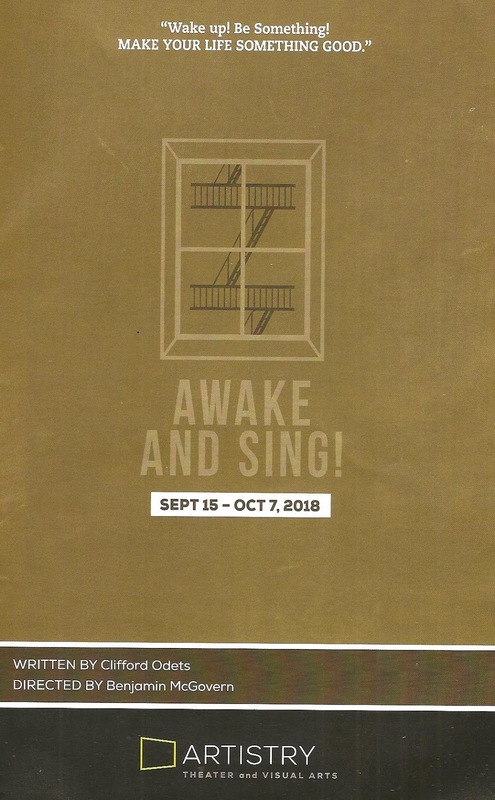 Awake and Sing!, now playing at Artistry's black box theater, is one such tragically beautiful and beautifully tragic play, like Tennessee Williams set in the Bronx. Or rather, since Clifford Odets' 1935 play predates Williams' major works, I guess I should say that Tennessee Williams is like Odets set in the South. The multi-generational Berger family has become beaten down by life, with the younger generation trying to break free and make a new life in this new country, if only it will let them. 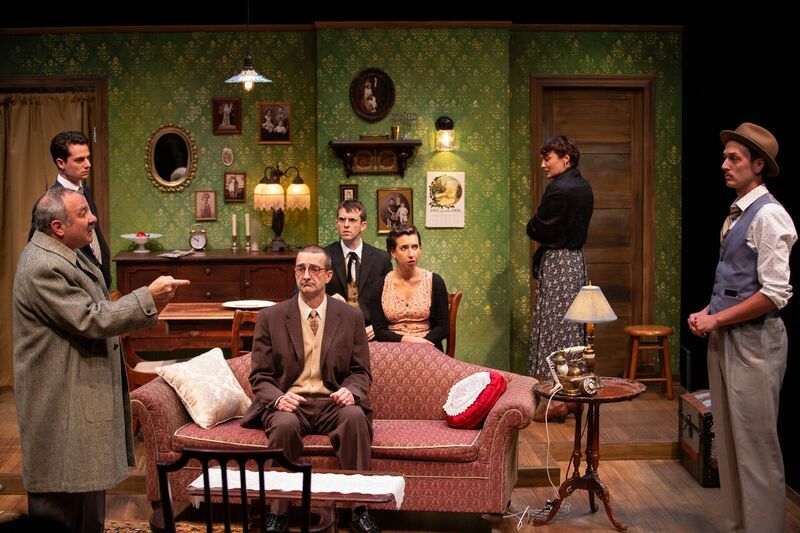 With a strong cast and detailed design in an intimate space, Artistry's production is beautiful and heart-breaking. 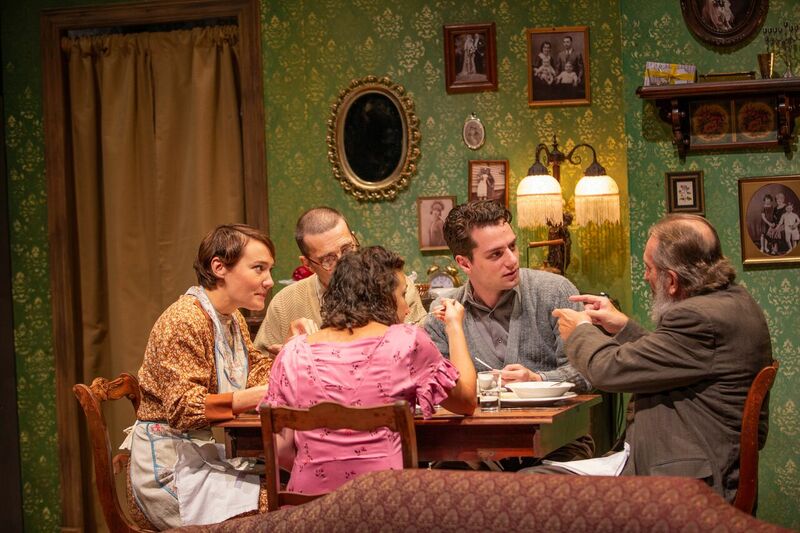 Myron and Bessie Berger live in a small apartment with Bessie's Russian immigrant father Jacob, and the couple's adult children Hennie and Ralph. Lacking enough bedrooms, Ralph sleeps on the couch in the front room, but his mother assures him that as soon as Hennie gets married he can have her room. Hennie wants more from life than marrying a man she doesn't love just to get out of her mother's hair, but a young woman in the '30s doesn't have a lot of choices. Ralph's tragedy is that he loves a woman of whom his mother does not approve, an orphan. The fascinating family dynamic includes a grandfather who's a friend and confidant to his grandchildren, a sweet but ineffectual father, and a strong and opinionated mother who thinks she knows what's best for everyone and won't take no for an answer. But I don't blame her, or think she's a bad mother. On the contrary, she's a good mother who loves her family and has had to fight every day for their survival. If she's a little harsh, well, that's the only way she knows how to survive. She's stuck in her life, but her children have a chance to make something bigger for themselves. Director Benjamin McGovern (who I'm pretty sure makes a cameo in the play), has assembled a wonderful cast, several of whom are new to the Artistry stage but not to #TCTheater. They create a believable family unit. Charles Numrich is charming as Grandpa Jake, and Jon Andrew Hegge is sad and sweet as Myron. Kate Guentzel gives a formidable performance as Bessie (despite being too young to play the mother of 20-somethings), and it's largely thanks to her that we don't hate Bessie, we see that there's a fierce love and determination behind the harshness. Miriam Schwartz and Ryan London Levin are also great as the younger generation, with a mix of resignation at the life they've found themselves in, and hope that it can be different. Rounding out the cast are Paul Rutledge as the war injured family friend, Howard Held as Bessie's well-to-do (and kind of jerky) brother, and Corey DiNardo as a possible suitor for Hennie. That's a lot of people for the small black box theater space, but it never feels crowded (or at least not more crowded than a small Bronx apartment should). And they all speak in great New Yawk accents (thanks to dialect coach Keely Wolter). 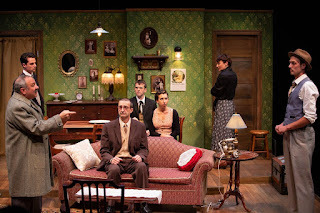 For this show, they've added seating on the sides of the stage to create a thrust, allowing the audience to feel up-close-and-personal, almost uncomfortably close to the family drama. Scenic and properties designer Katie Phillips has created a very detailed, realistic, and lived in home, every inch of space used for something, as should be the case when so many people live in one space. Costume designer Sonya Berlovitz has clothed the family in neat but not fancy '30s era clothing, in contrast to Uncle Morty's showy suit. This 80-year-old play stands the test of time. It's beautifully written, full of specifically drawn and very human characters comprising a relatable family, with realistic dialogue and situations. It's about a specific time and place in American history, explores generational conflict, and shines a light on everyday people who have to work hard just to survive. Artistry's production brings it to life beautifully in a way that you really feel like you know this family and feel for them (#bringtissues). 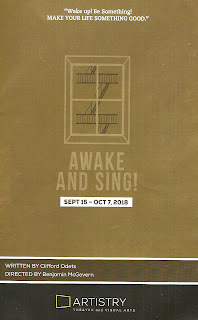 Awake and Sing! continues through October 7.